It is the sheer emptiness of this region that provides such great inspiration, whilst the history and geology is fascinating. A wonderful landscape offering a truly unique experience. Whilst there is some resident game all year round it is during the rains from November to April that the pans become covered in grass and draw in a volume of migrating game – springbok, gemsbok, elephants, giraffe and zebra. These large herds attract many predators – lion, cheetah, leopard, jackal and both spotted and brown hyena, as well as the elusive wild dog. At times, rhinos have also been sighted. Also to be seen are the eland, greater kudu and red hartebeest. Once the rains have started the bird life is also excellent. 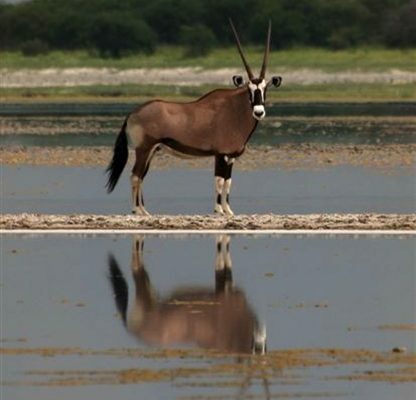 Makgadikgadi is an enormous flatland of salt pans and grasslands covering some 12,000 sq kms including the Sau and Ntwetwe pans which lie south of the Maun-Nata road. These are amongst the largest salt pans in the world with a truly unique ecosystem worth discovering through a variety of fascinating activities. The original and unique Jack’s Camp offers a luxurious and classical safari style camp. A very cool experience. An excellent lower cost option is Planet Baobab. Nxai Pan National Park lies just north of the Maun-Nata road and adjoins Makgadikgadi Pans National Park on its northern border. The Pan itself is another fossil lakebed about 40 sq km in size. The landscape is largely covered by grassland and dotted with clusters of umbrella acacia tree’s and mopane woodland in the north. The famous Baines Baobab’s at Kudiakam Pan in the south are also well worth seeing. The first permanant camp in the area open in February 2009 – Nxai Pan Camp – and has byukt an excellent reputation.